No matter what kind of summer camp you run, it’s always important to consider what type of beds you’ll need for your campers. 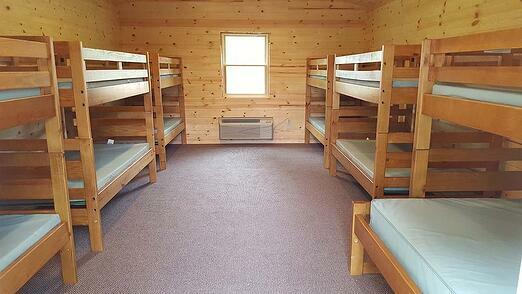 Bunkbeds are a popular style of bed for summer camps, and for good reason. Here are three benefits that make bunkbeds a great fit for summer camps. This benefit is huge for any administrator trying to figure out how to include as many campers as possible. Bunkbeds cut the total amount of space needed for bedding in half. Ladder end bunk beds also save you from having to invest in separate ladders. That freed up space allows you to potentially double your overall admittance. This extra space can also be used for more than just extra campers. Have you struggled to find space for other items, such as storage spaces or couches? Switching from standard beds to bunkbeds gives you that space, plus plenty of room for extra kids. We already mentioned ladder end bunkbeds as one option, but there are many others types of solid wood bunkbeds that you can choose for your facility. Mission-style bunkbeds are great if you’d rather have your campers climb up a separate ladder than the end of the bed. Bunkbeds can also come in different sizes for the top and bottom bunks. There are also loft beds, which are built like bunkbeds, except with an open space underneath for dressers, desks, or any other furniture item. If solid wood isn’t your thing, metal bunkbeds are another great option. Like solid wood bunk beds, metal bunk beds are extremely durable. They are also very easy to clean in case any campers happen to spill something or have an accident in the middle of the night. Ultimately, kids want to have fun. One of the great benefits of a camp is how the campers’ experiences can lead to positive social, emotional growth. Bunkbeds can play a part in this development. It can be fun for kids to climb up and down bunkbeds. Even better, campers can develop lasting relationships with their bunk mates. These experiences can lead to lasting memories that can build confidence. Plus, the camping experience can be a lot more fun for kids when they have a bunkmate to goof around with during their stay. Like all furniture investments, you want to make sure that you get bunkbeds that will last over multiple seasons. Whether you decide on wood or metal, contract bunkbeds are designed to last, making it a great choice for your campers. Start a Furniture Concepts Wish List to get a price on your choice of bunkbeds and any other contract furniture solutions.